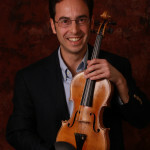 Violinist Tim Fain’s newest recording on the Naxos American Classics label features three pieces by Harrison. In the Concerto for Violin and Percussion, Fain is joined by the PostClassical Ensemble and conductor Angel Gil-Ordoñez. This excerpt will give you a sense of Harrison’s adventurous sound world, perhaps an extension of the innovations of his teacher, Henry Cowell. Harrison co-wrote the percussion work Double Music with John Cage in 1941.